The original block called King David's Crown looked a little boring to me, so I rearranged some of the colours and came up with this variation. It just made a little more interest in the centre of the block -- at least to me anyway. King David's Crown - Variation is considered to be a five patch block, since it is designed on a 5 x 5 grid. However, rarely do I sew a block together in five rows of five as is the norm for a five patch. I choose to construct it in "chunks" rather, in the manner of an uneven nine patch. The end result is the same, but I find this an easier method, construction-wise. 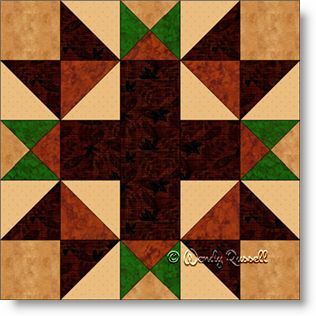 The block features lots of half square triangles and a few quarter square triangles -- (just to test your skills). Both of the sample quilts illustrated show the blocks set on point but they look lovely in a side by side setting as well. As you can see, subtle changes in placement of blocks and blank blocks (to showcase your quilting skills), can give a very different look to the end result. What can you come up with?